This is our third post in a new series we’re calling #UPclose—where we take you behind the scenes to meet our staff, show you cool things we’re working on, and give you a sneak peek into what’s next. Together, we’re inspiring a new generation of consumers to think secondhand first. What are the environmental benefits to cleaning out? Everything thredUP receives is either re-sold to other families, or recycled responsibly. So the clothing you’re no longer wearing doesn’t wind up in landfills. What are the financial benefits to cleaning out? We help families put cash back in their pockets, or they can donate their earnings to causes and charities in their communities such as Feeding America. Are there any new options for donating your Clean Out Bag earnings? 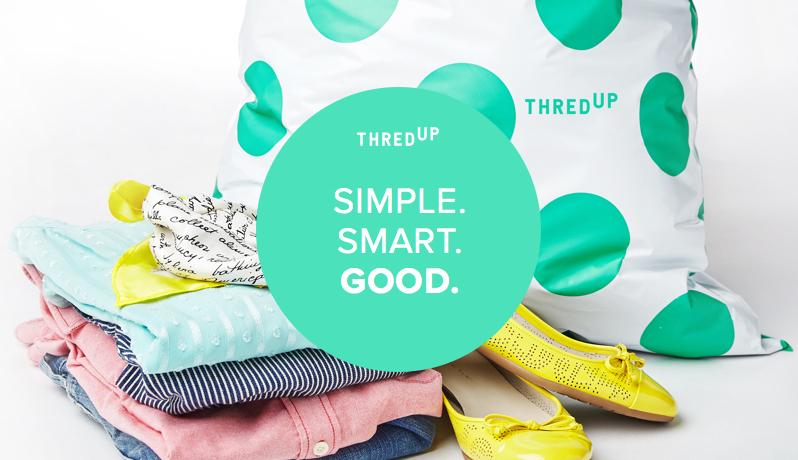 Over the next few months, we’ll be piloting a new program called thredUP for Schools, where you have the option to donate 100% of your Clean Out Bag earnings to a K-12 school of your choice. What types of items do you accept? On-trend, quality clothing, shoes and accessories that are in great condition. Basically the things you’d pass on to your best friends and family. Have nothing in your home that isn’t either useful or beautiful. What makes thredUP the best place to sell your stuff? It’s so easy! I used to sell items myself online, and it was such a hassle. I had to deal with shipping, the inconvenience, shady buyers, etc. Now I just toss everything into a polka dot bag and send it in. thredUP does all the work and I don’t have to think about it. Describe your style: I’ve always been a minimalist, and thankfully minimalism is trending right now so I feel like I can fully embrace it. I’m a lover of simple shift dresses, white button-downs, tailored jeans, and slightly oversized sweaters. Since SF weather is always on the cool side, I can get away with wearing black ankle boots with just about everything. The people. I’m surrounded by people who are incredibly smart, ambitious, opinionated, and really, really fun. At least once a week at work, I find myself laughing until I have tears in my eyes. I have a sort of my favorite brands, filtered to my size. It’s like shopping in a boutique designed especially for me. My Rachel Comey ankle boots. I wear them incessantly, they’re simple and perfect and they go with everything. A striped button-down in blue and white. Preferably by Equipment or Elizabeth and James. Beth Kirby: @local_milk – all the beautiful food, fashion, lifestyle and nature instas you could hope for. Olga Montserrat: @twelveofour – her style is a minimalist dream come true. National Geographic: @natgeo – always inspiring. The Reykjavik police department: @logreglan – there isn’t a lot of crime in Iceland, so the police have a lot of free time on their hands to be hilarious. Dame Traveler: @dametraveler – to keep my travel goals top of mind. Mad Men is and always will be a favorite. The women in that show are captivating, and the 60’s fashion is so good. Sweaters. I want every style! Boyfriend cardigans, chunky knits, fishermans, cable knits. The commute, actually. I’m lucky enough to live within walking distance of the office, and it’s the best. The downtown is almost always covered in fog in the mornings, and it’s so quintessential SF. It feels like living in a postcard. Also, I like to listen to French podcasts on the way. I think of it as a way to warm up my brain for the workday. Our summer interns introduced me to My Idol and it’s weird and hilarious. Instant favorite. Also, I can’t live without VSCO—I use it on every photo.